Leo season, my birthday month, and the summer heat wave is here! I have compiled a few of my favorite things this month just for you. Living in Galveston out of a suitcase for three weeks has kept me reaching for the same pieces over and over, yet these items are still my absolute favorites. Last year's free birthday gift from Sephora was a Tarte lip paint and blush... To. Die. For. I recently purchased the full size tube of the lip paint, because I love that the color is easy to wear every day. I used to be a lipsense addict with the long wear, but this lip paint lasts just as long so it has been added to my queue. 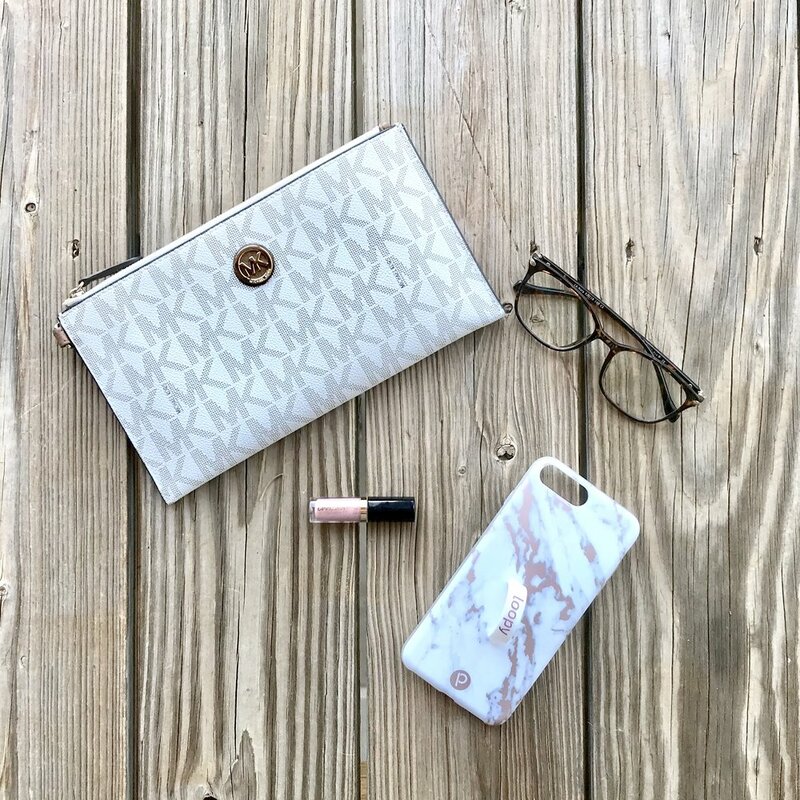 I won this clutch through a giveaway over 6 months ago and it is my go-to when I'm trying not to carry a whole purse (my go-to there is my Kate Spade blush pink satchel). It is large enough for my HUGE phone, cash, cards, and plenty of girly items you may need like lipgloss, tampons, etc. I linked to a similar item I am now obsessed with-> the leather studded clutch. I've had plenty of leather clutches in the past, but this one has a strong zipper, is easy to wipe clean, and the sheer size gives me all the feels. I've always been a fan of how cute glasses can look, but I've been blessed with 20/20 vision. However, now that I'm on my laptop hours a day and my insomnia has caused me to be watching TV late into the night I've gotten so many more headaches! This is why I originally looked into blue light blockers with LadyBoss glasses, but I just couldn't spend over $60.00 without knowing if they work. So with a little research I found the LifeArt brand on Amazon for under $20.00; MUCH BETTER! I actually received these as a birthday gift after picking them out and I am so glad I decided to give them a try. For a little background, blue light comes from electronics like the TV and our phones. These glasses claim to reduce digital eye fatigue, minimize headaches from staring at the phone or laptop, and result in better sleep. Worth a try, right?! My research told me that we want to block blue light 3-4 hours before bed because it will promote wakefulness and can lead to our inability to sleep. Honestly, I don't know if they truly make me sleep better or if it is a placebo effect, but I love these glasses and they are cute! So if you'd like to give them a try I definitely recommend this cheap alternative. I plan a large amount of my outfits from styles I have found on Pinterest and the lace bralettes have been huge this summer! I'm also obsessed with the silk cami top with jeans look, but I have not found one I like. Anyhow, Torrid has the perfect lace bralette if you need a larger band or bust size. I have it in purple and black, but if it came in other colors I would own them all. The best thing about this piece is that it is seriously comfortable and the lace extends an inch or two below the bust which I really love. $39.99 available at Journeys, Rack Room Shoes, Nordstrom, etc. They come in black, navy, white, and grey. I was out shopping with a friend and she kept raving about these shoes! As someone who has only owned the Target dupe of Birckenstocks, due to price, I rode off her recommendation until I she dragged me into Journeys. These rubber versions are only $40.00 and I have worn them literally every single day since I got them (thank you @bunsintheoven_). If you love those rubber jesus sandals that have been huge the past few years, then these are for you. I actually bought the mens version because they had my size in stock, so that is always an option. Having an iPhone 8 Plus my phone is way to big for my hand and I drop it constantly. I used the popsocket for about a year, but mine alway peeled off. So I finally decided to order a loopy case after seeing them sponsor some of my absolute favorite bloggers. IT IS WORTH IT! My last phone case was $4.00 on Amazon, so spending $40.00 was tough for me, but it is $40.00 well spent. I mean I use my phone all day, every day. The loop is rubbery, strong, and provides enough room for two fingers to hold the phone from the back. Plus the case is absolutely gorgeous. The marbled look is my absolute favorite...if you saw my kitchen accessories you'd know how true this is haha. There are so many designs to choose from though if you prefer busier patterns or even solids. Don't forget to use a discount code though, because there are so many available. And that's all! If you decide to try any of these items I'd love to hear if you enjoy them as much as I do.